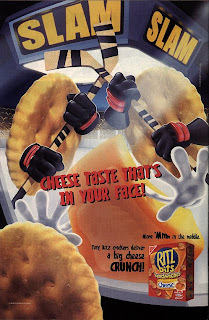 Ronn's Minor League Hockey Mania: Ritz Bits - Cheese That's In Your Face! I love collecting ads, and always love fining any new ads that feature hockey in some say. I recently found this ad on the back of a comic book (Batman Adventures #1, June 2003) for Ritz Bits Sandwiches, which features two Ritz crackers slamming a chunk of cheese into the glass. I love the ad, but I don't think you could pay me enough to try them. They are essentially two Ritz crackers (which I don't really like anyway), with some warm cheez Whiz glopped in the middle. More 'Mmmm in the middle. Not!